Monsoon, the season of greenery, fun and beauty, is best known for water-logged streets, garam chai, and serene beautiful weather. However with the monsoons also come dirty water, filthy pavements, and a variety of skin and feet problems. Read the Do's and Don'ts of foot care to keep your feet clean and happy during the rains. • Always keep your feet clean and dry. Wash them thoroughly with an antiseptic soap and pat dry as soon as you get home. • Deodorize your feet with a good talcum powder. • Use airy, strappy, plastic, or rubber sandals to avoid wet, smelly feet. • Always keep a dry pair of work shoes in your office/college locker, so that you can swap wet footwear with dry ones when you reach your work place. This will help you avoid feet infection. • Wear clean and dry cotton socks. Keep an extra pair of socks in the office, so that you can change them once you reach your destination. • Apply a moisturizing cream on your feet after cleaning. Moisturizing creams not only help keep your feet moisturized, they also prevent water contact with the skin. • Always keep your toe nails short and clean, to avoid toe infections. • Don't neglect the spaces in between your toes and fingers. Dry them with talcum powder to avoid fungal infections in between the spaces. • Do not neglect any infection, warts, and lesions on your feet. Consult your physician immediately. • If you want to pamper your feet, go for a homemade foot mask. It is more hygienic than the ones at salons and spas. • Avoid wearing closed, tight-fitting footwear. • Don't wear canvas, leather, or high-heeled footwear, as they get wet and uncomfortable, and increase your chances of infection. • Wearing soggy footwear and socks for long periods of time, causes swelling and smelly feet. Therefore, avoid them. • Avoid spa treatments and fish pedicures during monsoon as the hygiene at spas may not be up to the mark. 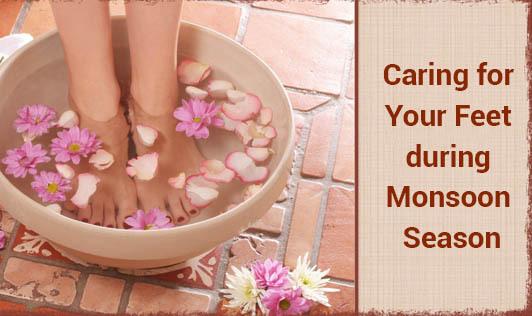 • Avoid scrubbing your feet during monsoons. You don't want nicks or sensitive skin that is prone to infections. Just keep you feet dry and clean and that is more than enough. • Do not self-medicate; always consult your physician in case you have infections.